First grade subtraction is a big step up from kindergarten. In kindergarten kids learn subtraction facts up to 5. In first grade that gets bumped up to subtraction facts to 20! Even though they only need to be fluent in subtraction facts to 10, that’s still a lot more facts to factor in. It is our hope that the resources in this section will give your kids the practice and motivation to be super successful at first grade subtraction skills. Please go to this page to choose from all the subtraction worksheets on this site. By the end of first grade kids should be able to demonstrate fluency in adding and subtracting within 10. 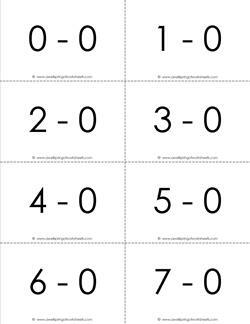 These sets of subtraction flash cards 0-10 will sure come in handy for learning those facts! They are separated by number for easy learning in smaller select sets, but also come in a large complete set of facts for 0-10. Choose color coded sets or plain old black and white. Need to practice your subtraction facts? Well, these subtraction flash cards 0-20 are an organized way to get that done! Print and cut out one set at a time starting with 0. Memorize those facts then go on to the next set. Mix up the sets and practice all those facts together to challenge yourself. When you’ve mastered all the facts fluently, work on being really fast with the facts.